Late Night Snacking at Sango! This Christmas was, I could say, the most stressful of all. Normally, I would have been done with my Christmas shopping by October and would start wrapping them up by end of November. This year was a different story, I barely realized how fast time flew that I found myself not even with a ready gift list when December came along. Squeezing in a bit of shopping during the weekend, it later then resorted to last minute "panic" shopping with my sister for two days in a row as we shop for gifts for the family. We were exhausted as we shop right after work but as Christmas gets nearer and nearer, we had to brave the crazy traffic, extend our patience as we wait in line for a parking space and keep our eyes wide open as we look for perfect gifts for our loved ones. Last night, we finally completed our respective lists and before heading home, we stopped for a quick late evening snack. Call it a reward that we truly deserve. Our choice was at Sango! which has recently opened a new branch at the 6th level of Shangri-la Mall. 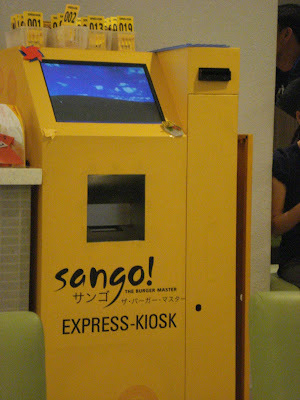 It has been a while since I dine at Sango and one thing new that we immediately noticed was the Express Kiosk. Word has it that the original owner of Sango sold his shares to a local businessman who also owns the company that makes vending machines. With their technological expertise, to have the express kiosk really elevates their service to another level as it allows diners to tap the screen and choose their orders themselves. This reduces errors as there will be multiple prompts asking you to confirm before proceeding to the next step. It's fast because the moment you have paid your bill, your order will automatically be sent straight to the kitchen. Cool huh? The mall was quiet already by this hour as we relaxed on two of Sango's comfy green couch. I like the cozy, study table feel of this branch. 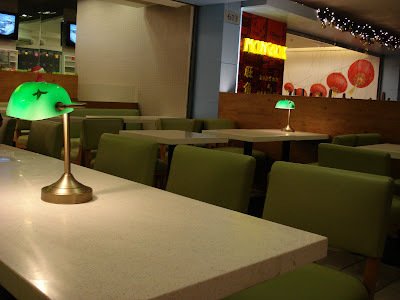 I say study table feel mainly because of the green low lamps on each table. Finally, our orders have arrived and boy were they piping hot! 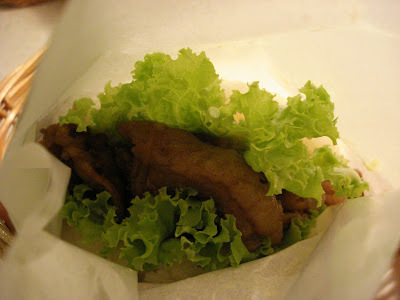 I got the Yakiniku Rice Burger (Php. 125) which I would consider as my guilty, meaty indulgence. I just can't get over how good their thin slice of beef that has a thin strip of fat which is cooked with Sango's Japanese marinade and sauce, packed together with Japanese mayo, lettuce and of course their rice buns. Yummy! How I wish Sango has more stand-alone branches that can open till late at night. With their delicious burgers and sandwiches, this can truly make a perfect late evening chow after rigorous shopping or partying with friends. Sango! is located at the 6th level of the Shangri-la Mall. They also have branches at the Powerplant Mall, Creek-Side Mall (Amorsolo Street, Makati) and at the South Supermarket in Alabang. Oh they have Sango na pala in Shang? Sayang andun pa naman ako last week.. kung alam ko lang! Haaay. Sana meron the Fort nalang din! However, they are different from Brother's Burger-type since they stand unique. For me, I can't compare the two since they have very different presentations. Sango Burgers makes their burger more of like a home-made burger, one that your mom would cook for you for your snack during recess times.